The issuance of the new Sunrise Plate is taking place through the regular motor vehicle renewal process from 2015 to 2017. The flat plate design includes actual photographs taken in our state of a buffalo, the state’s beautiful skies and majestic badlands. North Dakota's plate design won second place honors in the Automobile License Plate Collectors Association Best Plate of 2015 Contest. The type depicting the state's name was modified in 2016. 1. When did the state change the plate? Issuance began in November 2015. It will take approximately one and a half years to replace the general issue plates. 2. Why did North Dakota change the license plate? The 2013-2015 state legislature directed the NDDOT to create and distribute a new flat license plate for general issuance. The Buffalo Plate has been in use for 23 years and some of these plates are deteriorating and losing the reflectivity. 3. When will I get the Sunrise plate? Plates will be issued based on the vehicle registration renewal. For example if your renewal is in March 2016, you will get the Sunrise Plate for your vehicle upon renewal. You will receive a renewal notice in the mail and you can renew through the mail, online, or receive your plates at any Motor Vehicle Office. Click here for a link for statewide Motor Vehicle locations and hours of service https://www.dot.nd.gov/dotnet2/view/mvsites.aspx. 4. How much will the Sunrise plate cost? At this time there are no additional costs intended for citizens to obtain the standard series of the new Sunrise license plates. 5. Can I get my plate before my renewal period? Yes, early registration is allowed if a current decal or tab is available and the owner pays next year’s registration fee. 6. Can I keep my number or letters from the former Buffalo plate? Yes but if so, the plate becomes a personalized plate. You will need to fill out a Personalized/Special Request Plate form and a $25 dollar annual fee would apply. See North Dakota Century Code regarding the issuance of Personalized Plate below. At the request of a registrant, the department may provide special license plates marked with not more than seven numerals, letters, or ampersands, or combinations of numerals, letters, and ampersands, upon application for a special license plate and payment of an additional fee of twenty-five dollars per registration period, unless the plate is a gold star license plate or a prisoner of war license plate, then there is no additional charge. 7. Can I reserve a plate number? If you want any plate other than what is currently available in sequence at a Motor Vehicle office it would be considered a Personalized or Special Request Plate and a $25 annual fee would apply. 8. I have a low number plate, will I be able to keep this number, when the new plates are issued? No, per North Dakota Century Code NDCC 39-04-08.1 Low number plates 0-99 for the Standard issue plates can only be issued and/or approved by the Deputy Director for Driver and Motor Vehicle. According to NDCC 39-04-08.01 Assignment of Motor Vehicle Number Plates-Motor Vehicle number plates may not be assigned as a reward for any political activity, in recognition of any political affiliation or membership in any political party, or on the basis of political favoritism. However an elected state office may be assigned a single or double digit number on a number plate as requested by that official. The department of transportation may adopt rules governing the assignment of the numbers on motor vehicle number plates in accordance with this section. 9. What do I do with my old plate(s) once I receive the new one? You are encouraged to recycle your old plates at your local recycling facility or you can bring it to your nearest motor vehicle office where they can be placed in a recycle bin and then will be disposed of properly. It is suggested to bend or cut your license plate in half before recycling to ensure that no one else is able to use the plate on another vehicle. How can I order a Personalized or Special Request Plate (SRP)? All special plate requests must be from the vehicle owner and made in writing by filling out SFN 53612, it is required to provide a meaning of the plate. All current personalized plates are subject to review and approval before issuance at the time of renewal. Please note, even if the customer has had the personalized or Vanity Plate for years, the plate will be reviewed at this time. Any personalized plates will need to be ordered and could take up to 4 - 6 weeks before it is received. Therefore, renewal of personalized plates as soon as you receive your renewal invoice is suggested. North Dakota Century Code regarding the issuance of Special Request/ Personalized Plate. The National Guard, Antique, Collector and POW plates will stay the same at this time until all current inventories have been exhausted. Click here to see a poster of affected plates. 12. Will other specialty plates be affected at this time? Yes, all general issue Buffalo plates including Mobility Impaired, Veteran, camper, trailer, organizational will be changed over to the new flat Sunrise plate. Motorcycle plates will be replaced with flat plates when all current inventories have been exhausted. 13. Will organizational plates still be available? Yes, but they will be changed to the new Sunrise plate. Other embossed plates that do not have the Buffalo design on it will not be changed or replaced during this issuance. Non-buffalo plates will only be replaced with a flat plate after all current inventories have been exhausted or a special request has been submitted. 14. Will Motor Carrier plates be replaced? Yes, all motor carrier plates will be replaced with a new number defined in the new plate series. **Please note that owners with apportioned plates must request to replace their existing Apportioned plate when renewing their IRP. 15. How do I get plates showing updated font/lettering of the state's name? Vehicle owners who already have Sunrise plates are not required to obtain a revised plate, because it meets all standard plate requirements. 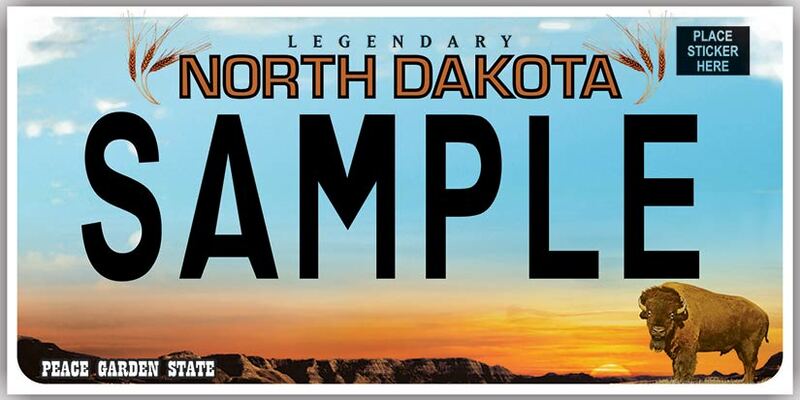 But if you wish to purchase a plate showing the updated North Dakota font you may do so for a fee of $5. The $5 fee, as required by North Dakota Century Code 39-04-13 is for the replacement of your current Sunrise plate with a new standard issue number. 16. Why was the North Dakota font/lettering updated on the Sunrise plate? The change was made in 2016 due to feedback received from the citizens of North Dakota. Didn’t get your questions answered here? Please email them to mv@nd.gov or call 1-844-NDPLATE (1-844-637-5283).